As you grow older, gravity takes its toll on every part of the body. Just like a woman needs a great support bra for her womanhood, a man needs superior support underwear for his manhood. There is nothing wrong with a little bit of sagging, it’s only natural. Yet, you don’t have to suffer pain or discomfort when there is a solution that leaves you comfortable in every activity. UFM Underwear was designed with the man in mind, no matter his age. Our US patented and Intl patents pending, adjustable pouch underwear gives sagging testicles the support they need. Whenever you have your UFMs on, you’ll have hammock-like support that is gentle, cooling and comfortable. Now is the time to take charge of your manhood by getting the support you need. Normal boxer briefs and tighty whities just don’t provide support like UFMs do. What Can Be Done to Help Sagging Testicles? Have you been suffering in silence without talking to loved ones or even a doctor about your pain? It’s time to bring scrotal sag into the discussion. You're not alone – trust us! Many men suffer from this issue, they are just hesitant to talk about sagging balls and the pain that comes along with it. You also may have noticed that just like your nose and ears, your scrotum has grown larger with age. If you are one of the men dealing with these problems, you can try nonsurgical solutions and may eventually resort to surgical ones if you aren’t getting the relief you need. The most important nonsurgical solution for saggy balls is support, support, and more support. While many types of underwear claim to provide support, you shouldn’t need to make constant adjustments to get relief. You also should not feel squished against your leg or in your pouch underwear. All too often, older men make the switch to tighty whities thinking they are getting support. Unfortunately, underwear that depends on elastic and cotton to hold everything in loses support with every wash cycle. UFM Underwear is the best men’s underwear for sagging testicles because it makes use of a drawstring which gently adjusts to support your manhood. Depending on your activity, you can wear your UFMs ‘high and tight’ for extra support or ‘slow and low’ for light support. You won’t be constantly adjusting with a pouch that fits like it is customized to your size and needs. If saggy balls are impacting your quality of life, making it hard for you to do things you normally could do, there are surgical options. The most popular option is scrotoplasty. Also called a scrotum lift, this is an outpatient surgery which removes excess skin from the scrotum. The surgery usually takes less than two hours. The recovery process depends on support. You can also get a scrotal reduction which is a similar procedure. These surgeries are popular among older men that are experiencing painful senior sag. Michael A. says, "I recently had...surgery, so I needed very good scrotal support which these provided very well. They're also very comfortable and the material is soft. Very good and smart design." After a surgery like scrotoplasty, the best way to recover and stay healthy for the long-term is with underwear made to support your manhood. UFM Underwear holds everything in place so you aren’t jostled around during recovery. Many men rely on UFMs to hold necessary padding or gauze in position so they can bounce back from surgery faster. Of course, you should always talk to your doctor or urologist about the best surgical solutions to treat conditions like sagging testicles. 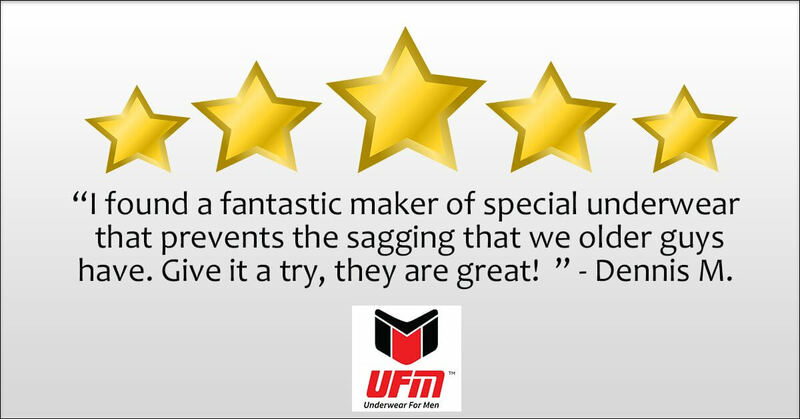 Once you put on your first pair, you’ll feel the difference between UFM Underwear and other options you’ve tried. This underwear are great for men of all ages and are a favorite among senior men with sagging testicles. R.C. says, "I bought one pair to try them out. After a few days, I went and replaced all my other underwear. I used to experience pain from constantly sitting on my testicles..." Whether you are in the preventative stage or are recovering from surgery, UFM Underwear can accommodate your manhood. The patented adjustable pouch makes it easy for you to adjust once and forget about your discomfort all day long. Thanks to a moisture-wicking material made from bamboo, you’ll never feel overheated or sticky. The pouch underwear is now available in seven colors with options for briefs and 6- or 9-inch boxer briefs. If you need a solution and much-needed relief from saggy balls, make a purchase today at www.UFMUnderwear.com. Your manhood will thank you! UFM Underwear manufacturers and sells adjustable pouch underwear in briefs and boxer briefs. The pouch in our underwear doesn’t come presized, it adjusts to your size, making it the most innovative support underwear on the market. UFM Underwear is recommended by urologists in place of jockstraps and compressions shorts especially in cases of sagging testicles. We have amassed over 1,500 5-star product reviews from men whose lives have been changed by patented pouch. We look forward to helping support your manhood.